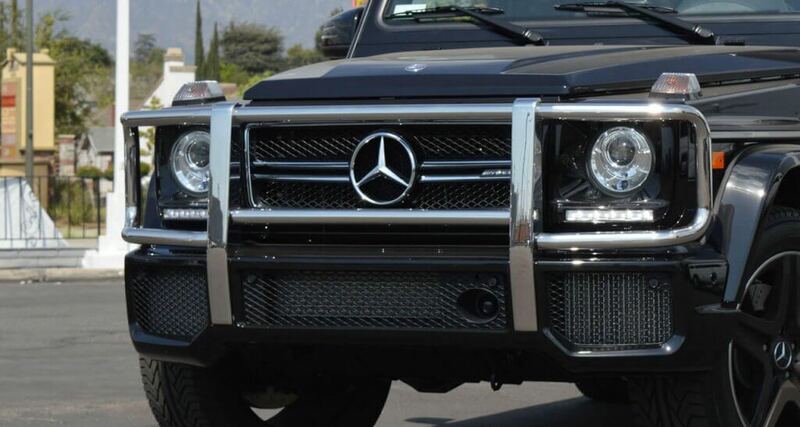 Mercedes Benz G63 AMG was the largest and second most expensive street legal SUV model manufactured by the company. The G63 AMG features six wheel drive running on 5.5L, 536-hp, 561-lb-ft twin-turbo DOHC 32-valve V-8 AMG engine. 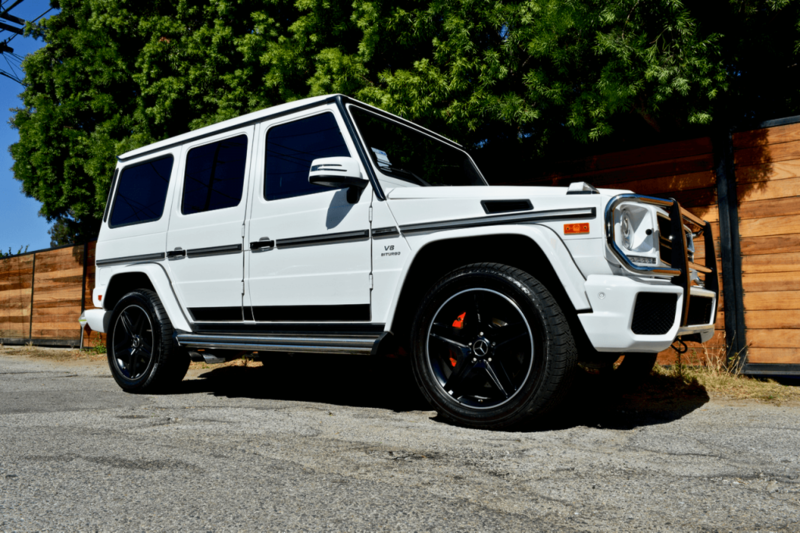 The G63 AMG was fitted with Mercedes’ 7G-tronic seven-speed automatic transmission; its transfer case can alter between a 0.87:1 high-range ratio for on-road driving and 2.16:1 low-range ratio for off-road conditions to all six wheels in a nominal 30:40:30 split. An extra shaft delivers power to the rearmost axle. The vehicle had five electronic differential locks, which can deliver 100 per cent lockup of all six wheels, operated by three switches on the dashboard. The Mercedes-Benz G63 AMG was launched in early 2013. The company decided to stop sales of the car and declared the model completely sold out in early 2015 to maintain model’s exclusivity. Mercedes-Benz managed to sell more units of G63 AMG than originally anticipated. The last customer delivery of G63 AMG will leave the G-Class factory in Graz, Austria in May 2015. 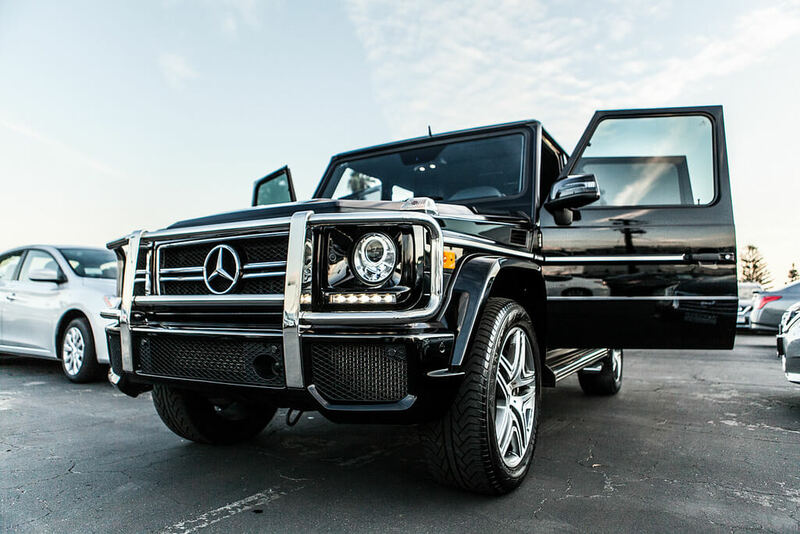 Contact us to rent a G63 Mercedes SUV in Los Angeles or Las Vegas. With a solid 30 year history under its belt, the Mercedes G class vehicle line up boasts tremendous performance and serious off road capability. Originally conceived as a military vehicle, it soon found many enthusiasts among civilians. Seeing this, later iterations of the G class began to incorporate more luxurious touches to make it a true Mercedes vehicle. The 777 Exotics G63 Rental is the latest offering of this illustrious lineage. 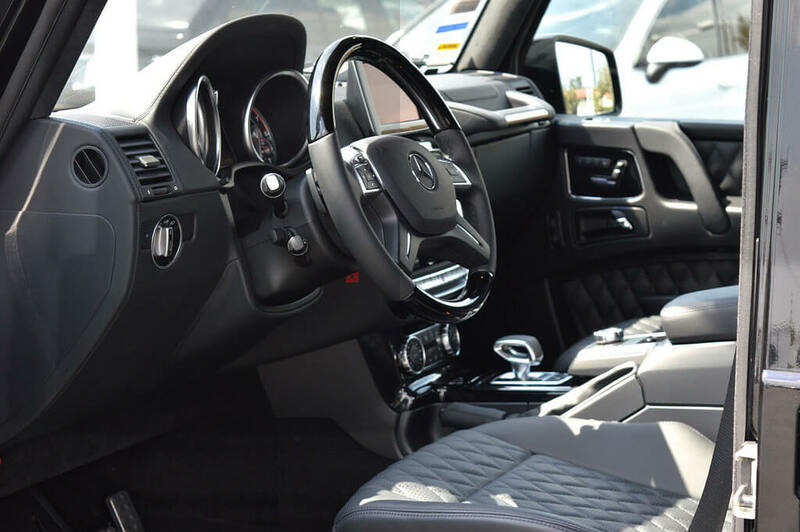 Its luxury features and serious performance are what make the G63 extremely sought after. It outranks the most SUVs in power and reliability, and available options make it the quickest 4×4 in its class. The G63 has a 4×4 as well as a 6×6 version. Its new V8 engine is modern AMG Speedshift seven-speed automatic transmission with a stop-start function and a choice of three modes. It differs from its predecessors by sporting a unique radiator grill and bumper, 20 inch alloy tires, stainless steel running boards and flared wheel arches. Other signs of distinction are the “V8 BITURBO” lettering on the front fenders and the Mercedes-AMG G 63 nameplate on the rear door. These changes to the exterior are meant to celebrate as well as protect the timeless appeal of the G class. The iconic boxy design from a time before aerodynamics was taken into account for military vehicles is one of the G class’ most recognizable and distinctive features. When you take a look inside, the true heritage of an AMG vehicle comes out. Generous leather trim, sporty bucket seats and other luxury touches stand out amongst the NAV SAT dashboard, rear parking feature, and other amenities that indeed create an atmosphere of sophistication in an SUV. With safety features such as 6 airbags (front and side for front row passenger and driver), ISOFIX Child Seat Fixing Points in Rear, Acceleration Skid Control (ASR) and Four-Wheel Electronic Traction System, Bi – Xenon Headlamps, LED Daytime Running Lights, Anti-Theft Alarm System with Tow-Away Protection and Interior Motion Sensor and a Tire Pressure Monitoring System among many others that are standard to this SUV, make it a high performance, hand-built vehicle that is reliable and dependable. 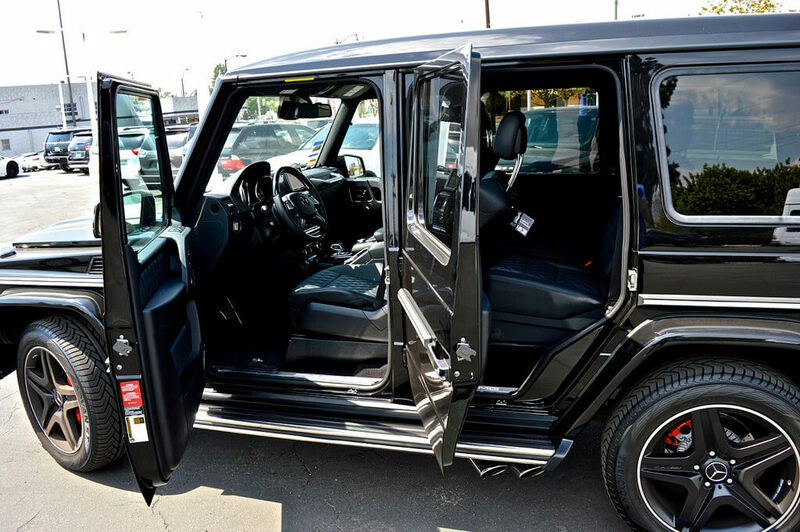 Given its breathtakingly expensive price tag, why would someone want to drive a Mercedes G 63? The answer may surprise you. It’s no simple task to engineer a military vehicle that is almost 3 tons and yet accelerates to over 60 in 5.4 seconds. If you’re in the market for an SUV, we suggest you look elsewhere if fuel economy, and good manners are on the top of your mind. However if you want a bold useful statement vehicle that looks like it can carry you and your guests through Arctic tundra, searing desert, and the streets of Los Angeles, then this is what you should get. 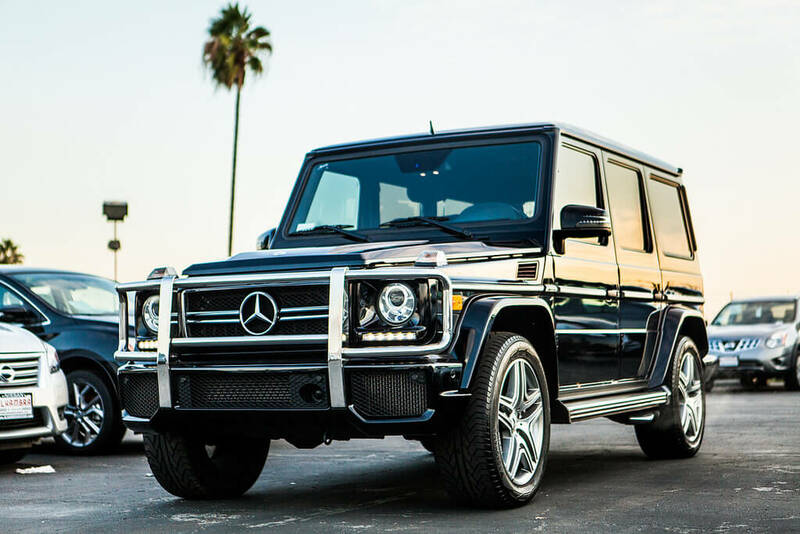 GET OUR BEST PRICE GUARANTEE ON G63 RENTALS AND HAVE MORE FUN WITH MORE FREE MILES THAN THE COMPETITION CAN OFFER.